Shook designed and built this 53’ long specialty trailer for the Diamond Vision Systems Division of Mitsubishi Electric Power Products Inc., who in turn provided it to their customer, Texas A&M Athletics. Capable of operation in winds of up to 40mph, the screen can be raised 30’ above the ground and rotated in any direction by Shook’s unique telescoping mast system. The exceptionally vivid Mitsubishi Diamond Visionâ LED screen is 26’ wide and 14’ tall. 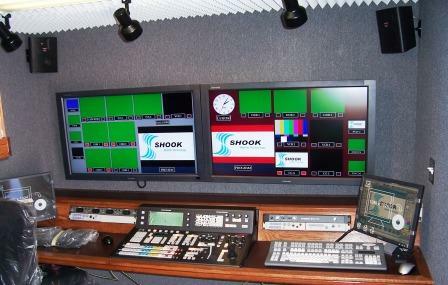 A complete TV Broadcast Production Studio is also on board, enclosed in a 19’ housing on the front of the trailer. A 70kw generator and full length retractable canvas cover complete the package. In order to fit neatly on the trailer and be legal for over-the-road transport, the giant screen has to split in half. Precise realignment of the two screens each time it is deployed is essential for proper operation. “Ease of use and safety were the two main factors driving us to incorporate PLC controls” says Heaney. The operator has complete control over the mast and screen system via a handheld touch-screen control panel. 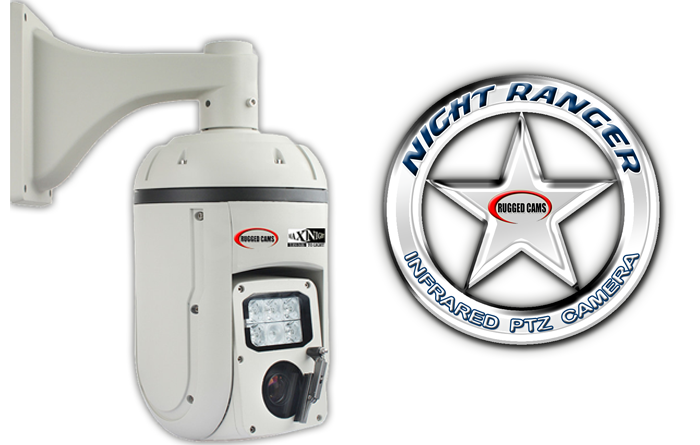 The system incorporates highly accurate encoders and sensors to constantly monitor the mast and screen’s position and movement. The PLC also monitors numerous safety inputs and will not allow operation if an unsafe condition exists.